Norman Martin tells a Daily News reporter that "God had made them [horses] for the service of mankind." It’s not just elephants and tigers in the circus who are broken by “trainers” in order to scare them into entertaining us. The horses who pull carriages in urban areas are broken too. 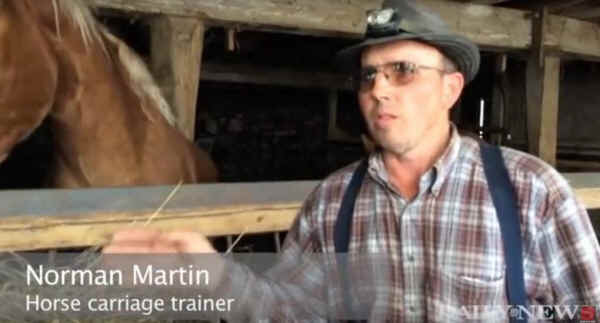 When the Daily News reported that Mr. Martin “gently caresses” the horses as a training method, did the editors know that this self-described “renowned trainer of carriage horses” published a book about using weapons and fear as his preferred method? NYC Mayor de Blasio ran for office on a promise to ban horse-drawn carriages from Manhattan as soon as he was elected, but he lost the support of the public after the carriage operators, Teamsters and media launched a coordinated campaign to protect the industry. Now, the Mayor is negotiating a highly controversial compromise, which would reduce the number of horses and house them in Central Park. To stay apprised of the effort to ban horse-drawn carriages in NYC, please visit NYCLASS and The Coalition to Ban Horse-Drawn Carriages. To see why activists have been fighting for years to take horse-drawn carriages out of NYC and other congested urban areas, please watch the award-winning documentary film BLINDERS.